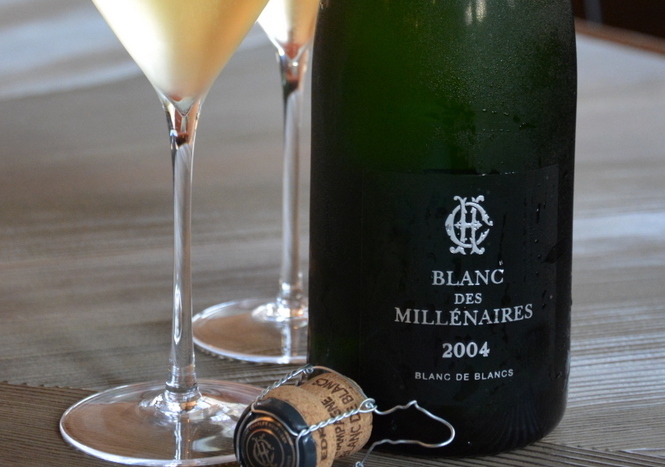 After 12 years of waiting, we finally have a new Blanc des Millénaires! Charles Heidsieck fanatics out there might notice something peculiar about the current range… namely that their prestige cuvée Blanc des Millénaires seems to have been stuck on the 1995 vintage since time immemorial?! You’d be forgiven for thinking so. Originally released in 2006, the story of Charles Heidsieck Blanc des Millénaires 1995 was told to us by current head winemaker Cyril Brun, during a visit to the house in Reims last summer. The seemingly never-ending 1995 vintage is a product of previous cellar master Daniel Thibault’s obsession with the harvest. 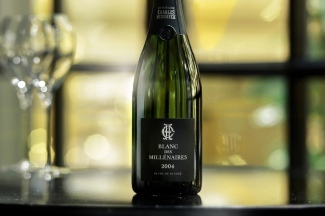 Reportedly, Charles Heidsieck were struggling financially in the mid-1990s and the board members consequently asked Thibault to limit production. However, they were too late – Thibault, sensing something special about the year, had already produced more than ten times what was necessary! Cyril simply said: “He was in love,” with an sympathetic shrug and a smile. 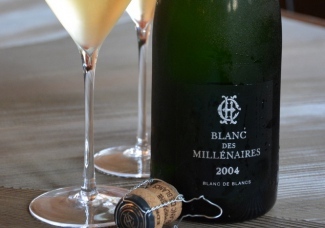 Fortunately, he fell in love for good reason: Blanc des Millénaires 1995 is a stunning champagne and still tastes youthful and fresh beyond belief, even recently being awarded the Best in Show trophy at the Decanter World Wine Awards 2017. However, all good things must come to an end, and with stock finally depleting, Charles Heidseick have revealed that a new vintage will be released this year. Introducing: Charles Heidseick Blanc des Millénaires 2004. Just the fifth vintage of the prestige cuvée since its launch over 25 years ago, this is a truly exciting release. We tasted it with Cyril last year, who explained to us how the rare cuvée is made. “[BdM] is the easiest champagne to make on paper,” Cyril began. “The blend is always an equal 20% contribution from each of the five top Chardonnay Grand Crus: Avize, Cramant, Le Mesnil-sur-Oger, Oger and Vertus.” The final product is therefore a unique expression of the vintage and all five are subsequently quite different. Speaking specifically of the vintage change, Cyril informed us that Thibault had been tempted to make both a 1998 and a 2002 but had produced too much 1995 for that to be feasible. However, by the 2004 harvest 1995 was due for impending release, and conditions were perfect. A “double harvest”, as Cyril referred to it, the yields in 2004 were historically high. Fortunately, the quality followed suit. No hail damage or spring frosts and a fresh summer followed by a warm September promoted healthy and ripe grape growth with perfect acidity levels. 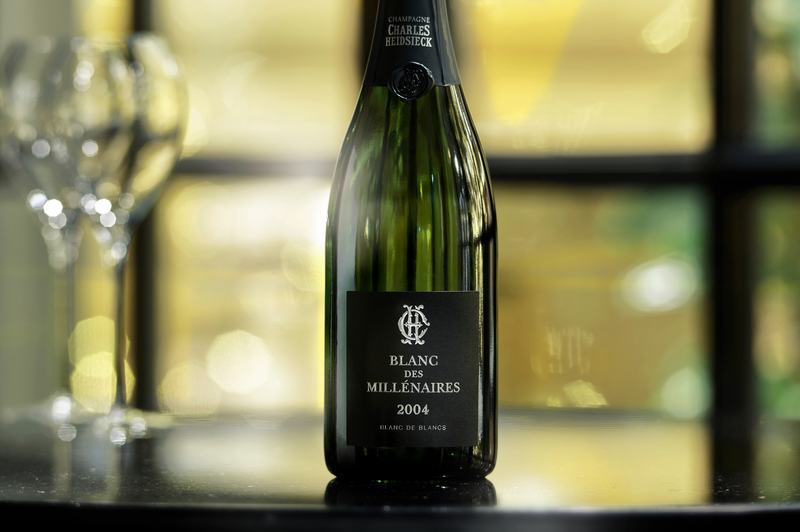 Régis Camus, Thibault’s successor and cellar master in 2004, made no hesitation in deciding to produce a Blanc des Millénaires vintage – a mere nine years after the last. And now, following an 11-year rest in Charles Heidsieck’s famous Gallo-Roman crayères, Blanc des Millénaires 2004 is ready for the market. The bottle we tasted was disgorged in November 2016 and was a strikingly yellow-green colour, showcasing all that juicy Chardonnay character. Impressive balance complements elegant tension: this is accessible now but is destined for incredible ageing. The official London launch is scheduled for mid-January and this will be available to purchase in February 2018.